A USAA commercial aired during the 2013 football season that featured three service academy alums — Army’s Collin Mooney, Navy’s Eric Kettani and Air Force’s Chad Hall — that have served their country as military veterans and now NFL players. They “took the road less traveled,” as they put it in the commercial. In this age of the overpaid and entitled athlete, the NFL couldn’t ask for better advertising from its own marketing division. 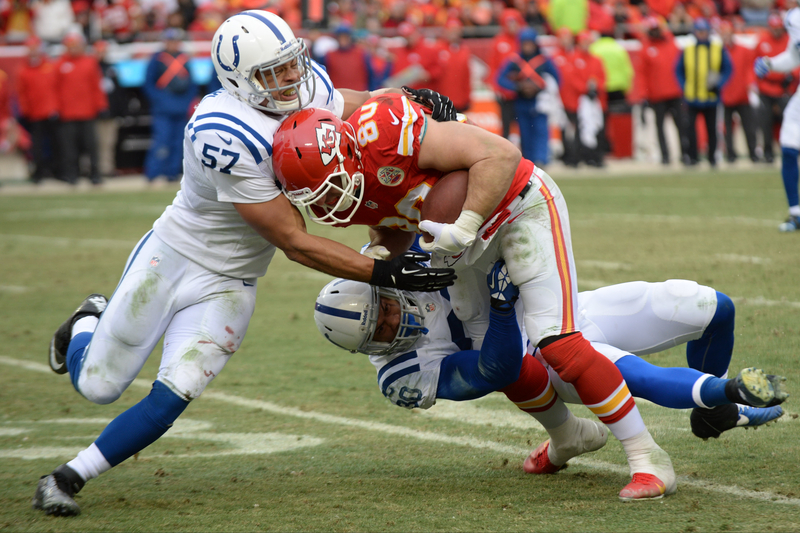 And Army — from recruiting West Point Cadets to attracting enlisted men — couldn’t buy better advertising than Tennessee Titans second-year fullback Collin Mooney and Indianapolis Colts rookie inside linebacker Josh McNary earned for the Army on Sundays this season. McNary’s Army free advertising included the first two round of the playoffs when McNary took the field with the Colts for a wild-card round win over Kansas City before the season came to an end with a division round loss at New England. He recorded 11 tackles — seven against Kansas City and four against playoff savvy New England. This is the time of year when college football players drop out of school and relocate to warm-weather sites to work with personal trainers who specialize in preparing athletes for a shot at the NFL. They’ll work hard — some harder than they ever cracked a book — in pursuit a dream that many of us held when we were kids. But it’s unlikely any of them worked harder before than McNary, an Army defensive end and West Point grad. This time last year McNary served as a 1st Lt. at Fort Hood in Texas while he trained for combine workouts on his own time. He caught the eye of the Colts at combine in Dallas, earned a contract and made the 2013 roster as 25-year-old rookie inside linebacker. McNary’s rookie season has come to an end against the Patriots, but not before McNary played his best football of the season, recording 11 tackles in two playoff games — seven in a win over Kansas City and four in the loss to the Patriots. A year ago McNary was on his second year of active duty as 1st Lt. with 3rd Calvary Regiment at Fort Hood in Texas. He opted for the Army’s alternative service option after two years upon graduation from West Point to pursue and NFL opportunity. He must still fulfill the remaining time of his five-year military commitment in the reserves. Any number of obstacles could have prevented McNary from making it to an NFL roster. First, he had a hard time finding a Texas college with a pro day that would allow him to work out with their players when NFL scouts were gathered on campus. But his father, George McNary, learned about a NFL regional combine in Dallas and McNary received an invitation, which the NFL doesn’t hand out liberally. McNary was never out of shape when serving at Fort Hood, but he reminds you football shape is something different. He began mixing in football workouts around his job at Fort Hood at a time when other NFL draft prospects are dropping out of school and working full-time with personal trainers. McNary performed so well at the regional combine in Dallas several teams contacted him with interest, but it was a no-brainer for him to sign with the Colts. The other teams wanted him to fly to their city for a tryout — not something easy to do for an Army officer. If they liked what they saw, they’d offer a contract. But Indianapolis offered to sign McNary without a tryout. Colts general manager Ryan Grigson had seen enough based his evaluation on McNary’s combine report and from previous scouting information he had on him from scouting him during his West Point playing days. McNary was slowed by a hamstring injury in training camp, but he was signed to practice squad. He’s been active since Nov. 26 for the final five regular-season games and the playoff victory. The Colts moved McNary from his background as a pass rushing defensive end to an inside linebacker in a 3-4 scheme, but McNary have proven to be a quick learner. He credited the tutelage of linebackers coach Jeff FitzGerald, a 20-year NFL veteran. Last week he called defensive adjustments against a Kanas City team new to the playoffs, but this week he’s facing the playoff-savvy Patriots and future Hall-of-Fame quarterback Tom Brady. “I’m extremely grateful to be in this position,” McNary said. “Things could have happened 20 different ways, but a lot of stars aligned for me with the combine and the fact the Colts already knew a lot about me. Army has offered me a great opportunity to play in the NFL and represent West Point. This is the second biggest weekend of the NFL season with the AFC and NFC championship games played on Sunday. Only the Super Bowl, of course, is bigger. Of all the expensive commercials broadcast aired this weekend and during the Super Bowl, the most inspirational air the first two weeks of the playoffs when McNary was on the field in a Colts uniform.